Good Saturday morning to you dear reader, it's bright and not too sunny this morning in Newcastle and that for me is perfect because I have a big wedding today, I'm really looking forward to shooting the wedding of Louise and Mike later today at St Teresas Catholic church in Heaton and then at beautiful Whitworth Hall, thats the one with the deer! 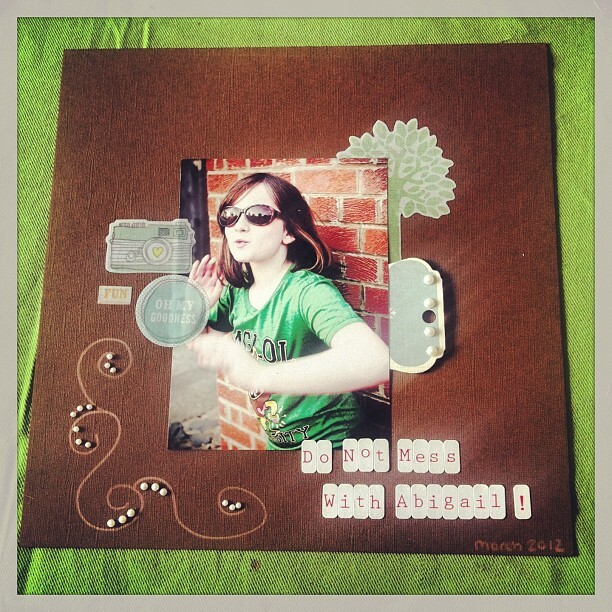 So I thought I'd pop a quick post up with one of yesterdays layouts entitled Do Not Mess With Abigail, there's some hidden journalling on the tag behind the photo but the title sums it up really, she's not one to be messed with. Crafty people, I have news of bargains, get down to your local TK Maxx or Homestyle because they have tons of crafty bargains including papers, pens, embellishments and ribbons, the Metrocentre Homestyle is particularly good, how I managed to be as restrained as i was and only spend £60 is a miracle but I came away with lots of scrappy bargains and now have enough Gel pens to last me my entire life, whats the betting that those pixies Abigail and Looby have pinched them all by the middle of next week?! I'll be in Jesmond Dene all day tomorrow or rather all afternoon, I have several mini sessions, next week sees my return to Tynemouth Longsands and it's looking like a very busy day, I have just a couple of sessions remaining, if you would like to book one there are more details and photos on my Facebook business page or you can contact me through my website or even email me. Have a wonderful weekend, I shall see you on the other side!